Since its inception in 1976, VTech has grown from a local technology company in Hong Kong into a global leader in electronic learning toys from infancy through toddler and preschool, the world's largest manufacturer of cordless telephones, and a leading electronic manufacturing services provider. During this incredible journey, VTech has successfully developed sustainability strategies for the long-term development of the Company, with a vision to design, manufacture and supply innovative and high quality products in a manner that minimises any impact on the environment, while creating sustainable value for our stakeholders and the communities in which we operate. 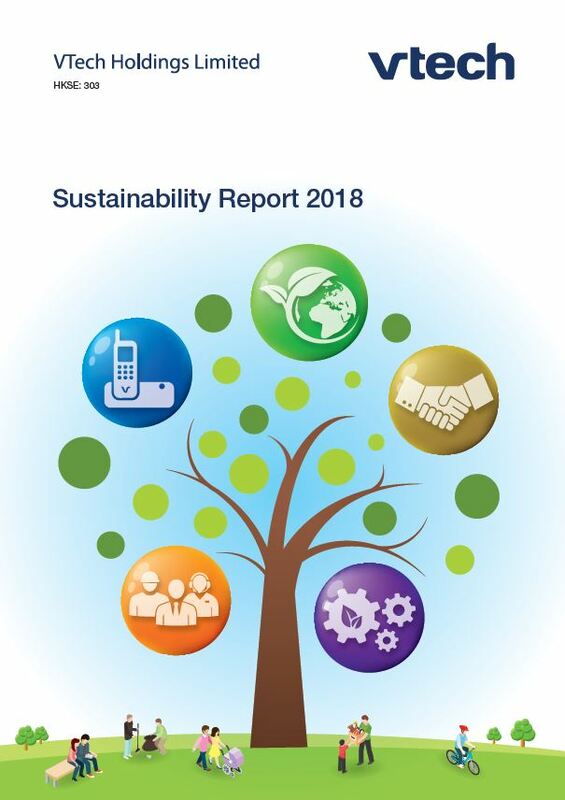 In our Sustainability Report 2018, we not only continued to follow the Core option of the Global Reporting Initiative (GRI) Sustainability Reporting G4 Guideline and its principles, but also made reference to the Stock Exchange of Hong Kong Limited Environmental, Social and Governance Reporting Guide (ESG Guide) to define our report content. 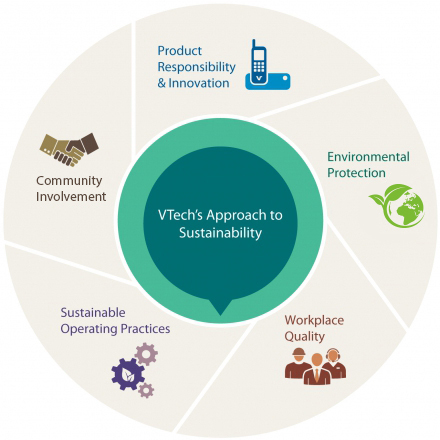 VTech's sustainability strategies and efforts continue to focus on five key areas – product responsibility and innovation, environmental protection, workplace quality, sustainable operating practices and community involvement. We are pleased to report that our sustainability approaches and activities have generated meaningful benefits for our stakeholders in the financial year 2018. Some of our major achievements are also highlighted in our Sustainability Report 2018. We have organised our sustainability approach into five key areas across the Company. VTech strives not only to provide high quality products and comply with the highest international and local quality and safety standards, but also incorporate sustainability concepts into product design in order to enhance the well-being of our customers and benefit the society. VTech has developed a high performance production chain to maximise our resources efficiency and improve the productivity while maintaining a green manufacturing and logistic practice. We also have policies in place to ensure that our operations are compliant with all the relevant environmental, legal and statutory requirements. VTech aims to provide a supportive, pleasant and healthy workplace for our staff, and to foster a caring community in our working environment. We care for our employees and recognise that having good staff relations and a motivated workforce play a vital role in the Company's efficient operations. VTech has policies and systems in the areas of Business Continuity Management, Supply Chain Management and Climate Change Strategy to ensure that we have a sustainable operating practice throughout the Company. VTech uses its expertise and resources to support the communities in which it operates, focusing on supporting people in need, collaborating with local charities, providing training opportunities for young people, nourishing an innovative environment and developing a healthy and green community.